Comparative Styles of The Farage Party & Hannan & UKIP! Not to mention the also rans of Plastic EUroScepticism we see with UKIP’s MEPs, Roger Helmer and much of the Tory Party all paying lip service to their god (of personal banking) to ensure their income streams! Dan Hannan would seem to be as driven by self interest and money as are so many politicians, just as is so very clearly the motivation of the UKIP clique and its claque – there is just a greater level of gravitas, wider interest and clearly a far greater level of research and education in the Hannan camp than in UKIP. It is a pity that Dan Hannan’s self serving behaviour and self enriching combination of jobs is so very out of step with his own party who seem so utterly corrupted by their ambitions for power and their devotion to The EU that they would seem to have far more in common with UKIP & its leadership than with Dan Hannan who in mild mannered tones and informed debate clearly persues his own agenda for as long as he – like Farage – can be seen to be his own master and call his own shots and to hell with the mere members and the electorate whom neither seem to address or inform! #0666* – Farage & UKIP Play The Fiddle Well whilst GREECE DEFAULTS! Farage & UKIP Play The Fiddle Well, whilst GREECE DEFAULTS! Meanwhile the Judas Goats and EUroPlastics like Dan Hannan, Roger Helmer, George EUstace and the like posture and clamour to order for the Tory Whips in a pretence of a Referendum! Someone tell them whilst they postured and congratulated themselves on their fundamental inconsequence The Express obtained 300,000 supporters and Nikki Sinclaire obtained and delivered for Parliament 100,000 fully verified signatures! Interestingly UKIP has NEVER achieved anything by way of petition or leadership – just the self enrichment of a small clique egged on by their ever hopefull claque who seek reward and denigrate all who may criticise their route to the troughs! just think where UKIP would be now if only it had at some time had a competent, honourable, trustworthy leadership and prominent policies of gravitas led by someone of stature. Just imagine after 20 years UKIP has only obtained less than 30 elected seats out of the 19,500 available in British governance, UKIP has never offered or INSISTED on training for its personnel or staff, branch chairmen and the like. Incredibly UKIP has never produced any kind of training/management manual and has never had a clear organisational structure and has since day one NEVER had a web site commensurate with the image they seek to portray. Astonishingly in 20 years UKIP has utterly failed to devise and present a coherent Exit and Survival Strategy for these United Kingdoms to Leave-the-EU in good order, clear of the benefits of self governance, self determination and sovereign independence to in liberty and dignity present its goods, needs, values and justice on the world stage. 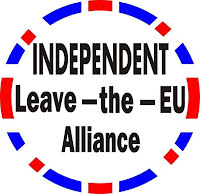 We are all well aware and sick of hearing how bad membership of The EU is but we have failed to reassure the British peoples of how on these United Islands we have presented the team that has led the world in ethics, morality trade and justice. We permit the scum of politics to seek, for their own personal gain, people like Tony Blair, Alec Salmond, Neil Kinnock, Roy Jenkins, John Major, Shirley Williams, Jack Dromey, David Owen, Michael Hesseltine, Jerry Adams, Ken Clark, Pieter Haine, Nick Clegg, Gordon Brown, Hazel Bleares, Harriet Harmon, David Bonkit, David Cameron and the like to talk down our abilities, denigrate our achievements and prostitute our future and all for their sordid personal ambitions and unpleasant gain. Not an individual of stature amongst them! Self serving self promoting self important nobodies! Had UKIP had sound leadership, vision, strategies, tactics and values as would be provided by a leader of stature UKIP could have capitalised on its greatest asset Nigel Farage – a good performer who could have trained an army of spokesment to spread the word to the world as we repatriated our democracy, restored our sovereinty, resconfirmed our justice, reinstated our borders and moved forward into the future as a proud and free United Kingdoms where the likes of the risible little squirt Alex Salmon, Pieter Haine and the like would have been shuned by a people of stature and dignity, shunned for the odious little men they are. Sadly for lack of leadership UKIP has achieved the sum total of nothing as one performing cockrel strutting on top of a dung heap of the weak and venal he has been allowed to gather around him do not a party of significance make. There is no doubt, insecure and amoral as he is Farage sets a tone it is hard to follow. Just think what UKIP might have achieved with sound leadership capitalising on Farage’s ability as a performer. All the time wasted on navel gazing, petty infighting, corruption, dishonesty and weak and self serving little creeps many hidden behind false identities all of whom have so clearly destroyed UKIP as they jockeyed for position and lied and cheated to try to get closer to getting their snouts in the troughs on the gravy train for enrichment through the bribes of The EU. With clear leadership, and let us face it there was no one else of note in The Referendum Party – it was the clear leadership of Sir James Goldsmith that forced the hand of Government and ensured Britain could not glibly be betrayed by entering the EUro with its totally predictable pending failure we see with the Default of Greece and for all its dishonest language Greece HAS defaulted! The EU in a desperate move to try to deny its abject failure may call it ‘Restructuring’ or is the buzz word ‘Rescheduling’ – but I put it to you that if you had £100,000 on deposit with your bank and it blithely told you it had restructured its payments to you so that it would only pay you £50,000 and would need you to deposit more for them to pay you interest and they intended to print more cash thus devaluing the money to half its value and it would start repaying if it could at some time in the future after devaluation and you MIGHT get £25,000 in value eventually – I just have this feeling you would call that default – if not outright theft NOT ‘restructuring’. Inventing words to dishonestly misrepresent situations is an old and rather sordid trick – consider homosexuals who instead of admitting they are perverts insist on normal heterosexuals calling them ‘gay’ – What dishonest balderdash! Just as calling the DEFAULT of Greece ‘restructuring’ – with an obscenely bloated public sector, a bit of tourism and absolutely no exports of consequence (well Feta Cheese and bulk olive oil for bottling overseas) Greece is BUST and has no choice but Default with absolutely no chance of survival within the EUro as with Italy, Portugal, Cyprus, Spain and Ireland – their only hope is charity and the only country able to provide that charity over the next 20 years, and it will take at least 20 years IF it works, is Germany. The downside is clear – money that would have advanced the EU scam and might have helped towards growth will now be squandered on demeaning the default countries as they emerge to follow Greece. The size of the debt and the piddly amount now on the table for the bail out is like the drunk peeing on a burning building to put out the fire – as the dawn rises over the ashes and the truth comes to light the building WILL have burned down but only dawn will show if the drunk fell in the fire and was consumed as the little hiss of steam as he urinated will be long forgotten. 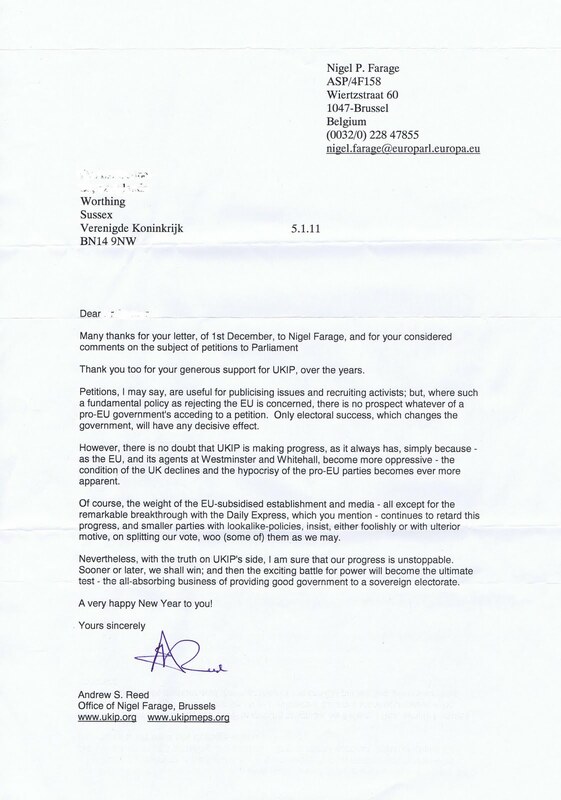 #0188* – UKIP Gets A Brief Mention In The INDEPENDENT – Jumping On The Band Wagon! #0188* – UKIP Gets A Brief Mention In The INDEPENDENT – Jumping On The Band Wagon!! UKIP Gets A Brief Mention In The INDEPENDENT – Jumping On The Band Wagon! MEANWHILE The Petition & The Referendum Campaign roll on! Such UKIP followers as are left after the catastrophic placement of Nigel Farage as their failed leader yet again will be irritated to note that Nikki Sinclaire MEP with The Petition Campaign for an EU Referendum in co-operation with such luminaries of the EUroRealist movement as Dan Hannan MEP, Roger Helmer MEP, Richard Littlejohn, Austin Mitchel MP, Roger Knapman, Trevor Colman MEP, Douglas Carswell MP, Prof. Tim Congdon, Jon Gaunt, Phillip Hollobone MP, Paul Nuttall MEP, Mike Nattrass MEP and others with the EU Referendum Pledge have moved a good way to eclipsing the near non existent antics of UKIP towards leaving The EU. It is interesting that just about the only thing that Farage seems capable off now as a spent force is insulting all around him from the President of The EU, to the Civil Servants and lickspittals, to his own MEPs berated on TV – he thrashes around making a fool of himself and his rump party having lost all who had political determination or ability as he picks fights with those who choose not to worship in his fiefdom – as shown by the abuse of Nikki Sinclaire and his over discrimination against her perfectly legal perversion as an openly declared Lesbian. That Farage tried to force his followers to sit with the racist, sexually intollerant, anti Jewish, criminals and the like that he gathered in sweeping the gutters of EU politics merely for self enrichment it seems speaks volumes of the demise of UKIP. That Farage’s stupidity led to the announcemnt of High Court Action against UKIP, Godfrey Bloom and himself at a press conference in London on the morning of the 05-Nov-2010 prior to the announcement and placement of UKIP’s back to the future leader that afternoon shows just how sleazy UKIP has become. Even The Independent describes Farage as a Band Wagon Jumper CLICK HERE I guess it is better than Spiv, Barrow Boy, Self Seeker, Phillanderer, disloyal, corrupt, chav, bully, clown and of course ‘performing monkey’ plus the many other soubriquettes he has attracted in his attempts to manage UKIP as his personal fiefdom surrounded in his ship of fools, having destroyed our Lifeboat, by some of the most unpleasant and dishonourable rogues in British Politics. Apart from a string of childish stunts, contempt for Court Rulings, defaults on debts, consorting with prostitutes in public, drunkenness and utter incompetence it is hard to think of an achievement of Farage & his fan club – Clearly none have moved Britain one inch closer to leaving The EU and his belief that he has a divine right to ignore the laws and regulations he as a law maker is responsible for has all the hall marks of his dishonourable amorality on almost every front. That said there is absolutely no doubt this little man is UKIP’s greatest assett as few people of any integrity would wish to be associated with his behaviour and he is left with the ill informed and those he pays to sing his praises. Whilst stuffing his pockets and working his way through his staff it is astonishing that he then acts to assist those seeking to climb his greasy poll to befoul the party by making attacks on his personal enemies who expose him for what he is – this is seemingly done with outright disregard for the damage it does to what is left of his squalid little band of sychophants and any initiative those who have sought to distance themselves so that they can promote measures of a patriotic nature with referendums and petitions ratjher than ensuring his personal enrichment. Clearly Farage cares little for Britain, little for UKIP and a great deal for his own ego and his harem and EUnuchs that form his protection from the truth. Read again CLICK HERE sadly all too true. #0123* – UKIP’s SPOILER IS THE THIRD BUS – SET TO YET AGAIN PICK UP FEW PASSENGERS! SET TO YET AGAIN PICK UP FEW PASSENGERS! – SET TO YET AGAIN PICK UP FEW PASSENGERS! UKIP’s LAST TWO SEEM TO HAVE BEEN SCAMS! two complimentary Buses with different and complimentary routes to the same destination and a rag tag of fly by night taxis trying to pick up funding and a few bewildered passengers put out by The UKIP Garage. Should that be UKIP‘s Farage as the last two petitions he has been party to were nothing more than blatant scams. They were NEVER delivered and the £1/4 Million of tax payers money that went into one was never accounted, and seems to have vanished into the pockets of those responsible, as did possibly £1+ million or more from the Ashford scam, seemingly founded on the addresses garnered from the petition, and a breech of the ethics of Data Protection! It is worrying that even after the huge amount of money that went missing unaccounted from Ashford where even David Bannerman as Farage’s puppet chairman admitted there had been no control and less than 15% of the money collected for UKIP ever reached the party, whether that included the money laundered through Graham Booth’s hotel accounts he did not specify!! To see the same team – Farage, Bannerman and Croucher (with Lott once more, presumably again using the data base – mailing out letters to promote Farage’s financial interests) all merrily launching a new fleet of ‘dodgey taxis’ but even more purturbingly doing it in a childish and petulent assault on The Peoples’ Petition because it is run by Nikki Sinclaire MEP, aided now by Mike Nattrass MEP and The EU Referendum Campaign because James Pryor and Bridget Rowe set it up and Dan Hannan MEP and Paul Nuttall MEP have joined it!! You will even note that Farage has his team all working closely together for his re-election, and clearly states NOTHING about a petition but openly advocates a call center. Be minded when he pronounced that Ashford was the most successful thing UKIP has ever done yet, to the press, for whom one must ask, as 85% of the money raised AT LEAST would seem to have vanished! We note he clearly states his intention to set up another ‘Call Center’! You may care to note that since the article below was written it has been agreed that http://TheMidnightGroup.Blogspot.com form a point of referrence for GENUINE petitions and although JUNIUS somewhat harshy claims Farage was refused participation – strictly that is not true just as he was not refiused co-operation with Libertas and Declan Ganley it seems there he was refused access to the funds and with The EURC hethey were not willing to put him in charge! So like a spoilt child he registered Libertas at Companies House to try to blackmail declan Ganley – he failed (as of course did Ganley but little wonder!). It looks like de Ja Vu all over again! Farage is acting like a spoilt child and using UKIP to try to run a spoiler annoyed that those who have moved onno longer enthralled watching him feather his own nest at the expense of Britain and UKIP. 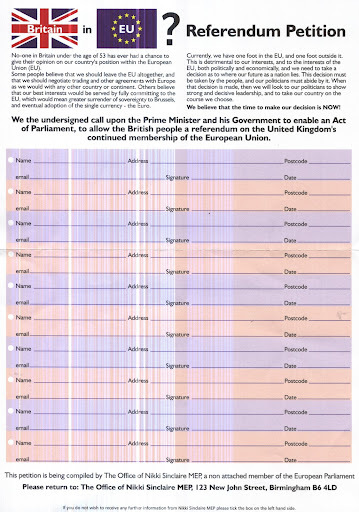 What must particularly annoy is that The Peoples’ Petition is already up to about 20,000 (exact No. not counted as they have only counted full sheets of 10 signatures those with 9 0r less have not been counted and are slowly being filled by incoming phone calls – the estimated 20,000 I am assured is a fair judgement) – either way that outstrips Farage’s previous petitions! The aim is to get the first 100,000 and deliver them to Drowning Street and the certificate of delivery with the petition to The Speaker’s Chair as demanded by our democracy. It is expected that the donations already in on top of Ms. Sinclaire’s substantial personal contribution will now put The Peoples’ Petition in a self liquidating position to advertise to back and promote the achievement with the second and subsequent 100,000s progressively easier to obtain as the public catch on. Meanwhile the efforts of The EURC ploughs its own complimentary furrow working with The Peoples’ Petition but aimed at solid promotion of the need for a referendum on In or OUT of The EU with politicians, Councils, Commerce and big businesses – already Labour EUro Safeguards Campaign is on board as are The Boo Group and representatives of major Trades Unions. Please enlarge this form to the appropriate size and print off a few to get filled in by family and friends – neighbours and work mates – maybe even strangers!! The Brits, with their characteristic downbeat outlook have a saying, “you wait forever for a bus and then three arrive at the same time”. A situation that anyone who has been hanging around Place Luxembourg can relate to. So far, three have turned up. It’s uncertain how many more are due. First out the starting gate was Nikki Sinclaire MEP, who left the EFD Group because of what she saw as anti-semitism and homophobia amongst its members. 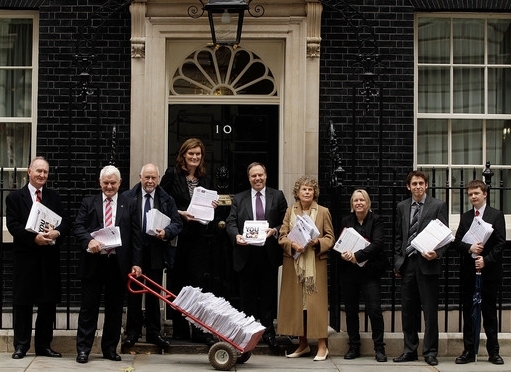 Her campaign, which she dubs ‘the people’s petition’ is trying to raise 100,000 signatures. She argues that the UK is neither in, nor outside the EU and a referendum on membership will provide a firm position for the country’s future relationship with Europe, either inside or outside the union. She is touring the UK garnering signatures. She claims to have had 10,000 in the first week of campaigning. UKIP responded to this by launching a referendum petition of their own their third in recent years. One that closed in 2008 had 10,782, another one, launched in November 2009, seems to have disappeared. It remains to be seen how the latest will do, but there doesn’t seem to be much promotion behind it and it is said that some UKIP people are a little embarrassed about launching a second petition. Sadly, there is no joint campaign against cliches and tired metaphors. To view the full article CLICK HERE as it seems there is also no joint campaign for tired associations to fill column inches!